Food Costs > How Much Does Pizza Dough Cost? How Much Does Pizza Dough Cost? Pizza dough, as you may know, is the most integral part of the whole pizza, even more than the toppings. No matter what kind of pizza you choose or what toppings you enjoy, every pizza will have a crust made of dough. Some people consider the crust to be the best part, while others never eat the crust. Most pizza dough is just like bread, mostly consisting of flour, salt, water, egg, and oil. Pizza dough is usually kneaded by hand or by a slow speed mixer. The cost of pizza dough will depend on the quality, brand, if it’s fresh and where it’s being purchased from. On average, the price for the pizza dough ranges from $2 to $4 per 16-ounce bag. These are pre-made bags that will only require water. For instance, the highly rated Betty Crocker Pizza Mix and Pillsbury pizza dough retails for around $1 to $3 at your local grocery store. At Trader Joe’s, for example, their 16-ounce bag of pizza dough in the refrigerated section retails for $1.29. It comes in three flavors: regular, whole wheat and garlic. Whole Foods also has a pizza dough for a similar price. A blog post on Recipe.com talked about pizza dough at their local grocery store. At Safeway, for example, you could purchase a bag of frozen dough for close to $1.70. Comparing making dough to purchasing it at the store, the verdict, which you may have expected, was to make the dough at home to save money. A larger purchase, such as a five-pound sack, can cost close to $15 or about $3 per pound. For restaurants, larger cases, which often hold close to 100 dough balls, will retail for about $1 to $1.35 per ball. Pizza dough will be found in the refrigerated section, freezer or baked goods section of the grocery store. Box mixes will use a power that needs water added to it, while a refrigerated pizza dough, such as the Trader Joe’s mentioned above, will be found wrapped in a clear bag in the refrigerated section. This type of dough just needs to be brought to room temperature and stretched out for use. You can also find pizza dough already baked, usually in the pasta/sauce aisles. This type of dough will be in a clear bag and will be rolled out, ready for the toppings, cheese and sauce. Pizza dough can be frozen to prolong the shelf life. If freezing, defrost it for a few hours before you intend to use it. To store unused dough, slide it into a freezer bag and seal, making sure all of the air is out. If you have a FoodSaver or vacuum sealer, then this could work as well. Place it in the freezer and it can last up to three months. When you’re ready to use it, simply take it out, let it thaw (about 12 hours) to room temperature and enjoy. 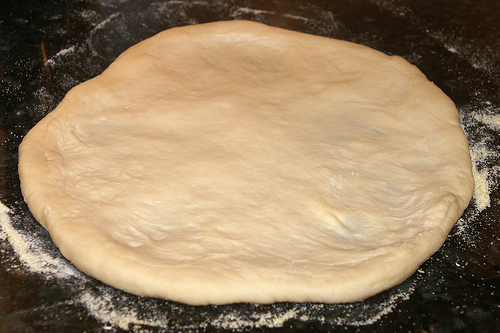 Although several stores carry pizza dough, consider making the dough from scratch. Many of your dough recipes will only require flour, yeast, sugar and oil. With these ingredients, you should be able to make your own dough for less than $1. Store-branded premade pizza dough will almost always be cheaper than the name brand and will contain the same ingredients.